Zach Johnson may not be the hottest name in golf, but the two-time major champion has shown a rise during his thirties and appears to have a lot left in the tank. 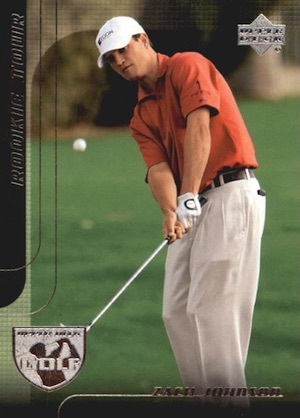 Still largely underrated, the following guide looks at five of the top Zach Johnson golf cards to collect. 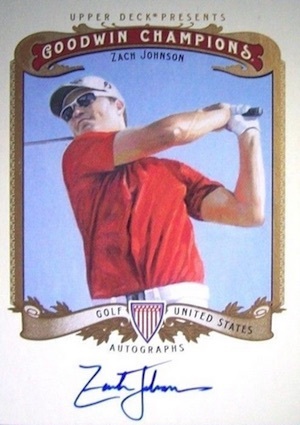 Shop for Zach Johnson cards on eBay. Following a successful college career at Drake University, Zach Johnson turned pro in 1998 and later joined the PGA Tour in 2004. After a slow start that only yielded one PGA Tour victory, Johnson notched a surprise win at the 2007 Masters. While that notable title did not lead directly to stardom, Zach Johnson added a PGA Tour win each year from that point on and became a consistent performer. He earned his second major championship at the 2015 British Open (The Open Championship), besting Louis Oosthuizen and Marc Leishman in a four-hole playoff. Given his age and the young stars that have surged to the forefront of the golf world, the potential for Zach Johnson cards is still limited. However, Johnson has proven to be a legit contender, and, if he can string some wins together, there is still room for growth. Zach Johnson's cardboard career began around the same time as his PGA career. Starting with 2004 products, Zach Johnson has been regularly featured in golf products up to 2012. Check out the key Zach Johnson golf cards below. The overall top choice for collectors, Zach Johnson's 2004 SP Authentic rookie card is heavy on green and signed on-card. While the higher print runs keeps values in check, this is the card that will see the most most movement and interest if Johnson adds a few more big wins to his résumé. 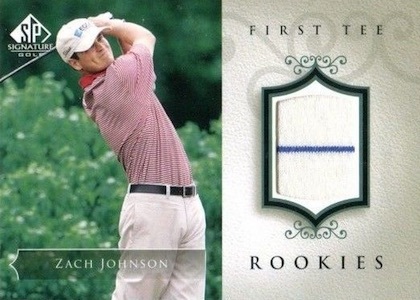 Featuring an even-worn shirt, the First Tee Rookies card for Zach Johnson is his official rookie card from 2004 SP Signature. Prices are reasonable but the relic cards don't surface nearly as often as his other two rookie cards. 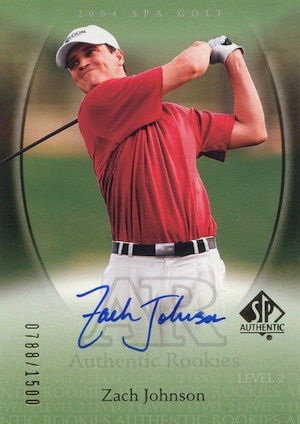 The final Zach Johnson rookie is a budget offering from the base Upper Deck set in 2004. While values will never push very high, the card presents a very easy and inexpensive way to acquire a rookie card for Johnson. Still one of the most popular golf autograph sets of all-time, Inked Drivers utilizes a faux-driver head as a signing surface. Several tiers of color and rarity are available for Zach Johnson. While it is not numbered, the 2012 Upper Deck Goodwin Champions Autograph for Zach Johnson boasts an on-card signature and classic design. Johnson is part of the Group D short prints, which includes ten subjects and overall odds of 1:185 packs.